It can be frustrating to wake up each morning to a breakout. Whether you’re a teenager or adult, acne breakouts can take a toll on your self-esteem and prevent you from living life to the fullest. If you’ve tried countless treatments for acne and are tired of seeing minimal to no results, you’re in luck. Here at The Langdon Center, we offer LaserClear, an effective, drug-free solution to moderate to severe acne. 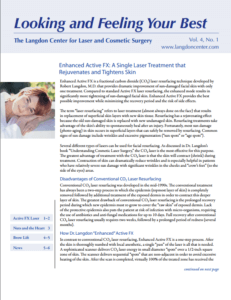 Let’s dive deeper into what LaserClear is and how it can change your life for the better. During a LaserClear treatment, two separate lasers are used to deliver gentle energy to the skin with minimal discomfort and absolutely no anesthesia. The laser treatments are administered one after another and each treatment takes 30 minutes or less. After a series of LaserClear treatments spaced two to four weeks apart, up to 80% of patients enjoy long-term acne improvement. We are pleased to be one of the only laser centers to offer both of the lasers necessary for this revolutionary acne treatment. While topical acne treatments may work for individuals with mild acne, they are usually not powerful enough for those with moderate to severe acne. If you are living with moderate to severe acne, you are likely familiar with oral antibiotics and Accutane. Although oral antibiotics may be effective, they are not a cure for acne and must be taken for a prolonged period of time. If you stop taking them and you have not “grown out” of acne, your breakouts will likely reappear. Accutane is a potent drug that is often a cure for acne yet is monitored closely by the FDA because it can cause birth defects and other serious side effects. LaserClear is superior to both oral antibiotics and Accutane because it doesn’t involve any drugs or serious side effects. It’s highly effective, safe, and ideal for moderate to severe acne sufferers of all ages. If you’re ready to say goodbye to breakouts and enjoy the beautiful, smooth skin you deserve, we encourage you to schedule a LaserClear consultation at The Landon Center in Guilford, CT. Call us at 203-717-9592 or fill out or convenient online contact form.